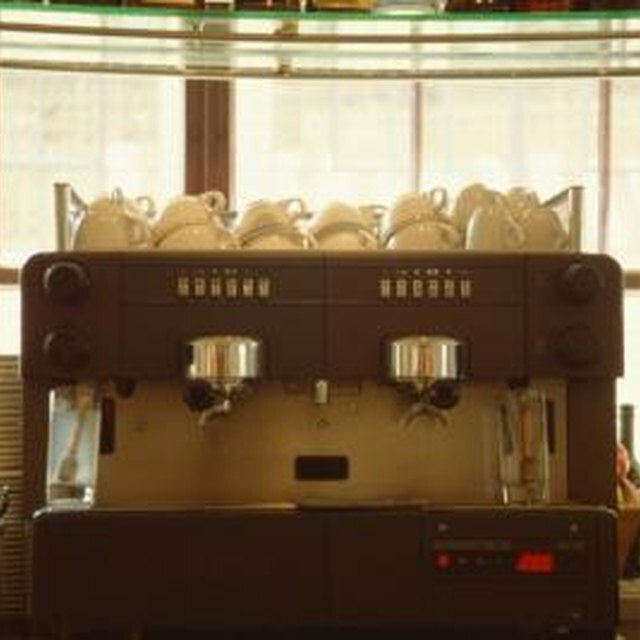 The Bunn Pour-O-Matic is a coffee maker designed primarily for commercial use in hotels, restaurants, cafeterias and other larger-scale settings. The Pour-o-matic has two coffee pots and can brew around 3.8 gallons of coffee per hour. The unit features stainless steel compartments and has four warmers, which allows near-constant coffee production and warming. If issues arise with the Bunn coffee maker, troubleshooting methods may be useful in fixing the problem. Verify that the Bunn Pour-O-Matic is connected to a power outlet if the machine is not working. Replace or reset the circuit breaker or fuse if necessary. Place a new filter in the holder if there is water leaking. Use only Bunn brand filters, as other filters may fit the holder poorly, resulting in leaking. Measure out the coffee grounds prior to placing coffee in the filter and shake the filter gently to even out the grounds if you have found coffee grounds in the coffee. Approximately 1 tbsp. of ground coffee per cup of coffee to be brewed is recommended. Turn off and unplug the coffee maker if coffee is spraying when dispensing. Pull out the spray head and insert the included deliming spring into the spray head. Wiggle the deliming spring back and forth and then remove the spring. Wipe the spray head with a damp cloth and push the spray head back into position on the coffee maker. Contact Bunn for additional assistance.